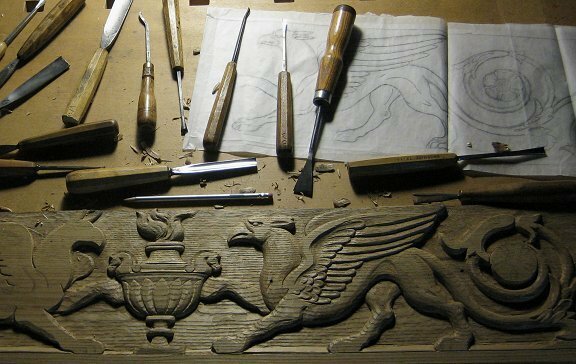 Designed for novice to intermediate students, my classes focus on the tools and techniques of relief woodcarving using chisels, gouges and mallet. Beginners will get a good foundation in traditional woodcarving and intermediate students will be able to build on their skills. Through demonstrations, exercises and individual hands-on instruction students will learn the various uses of woodcarving tools; how to sharpen chisels and gouges by hand; the proper use and control of tools for incising, setting in, grounding and surface modeling; the properties of different woods for carving; and about some basic finishing options. I will provide the project design, materials and a basic set of tools (for classroom use only), though intermediate students are welcome to use their own tools or contact me in advance to discuss bringing their own design. Because class size is small (4 students maximum) and our setting informal, I can respond to each student's goals with one-on-one instruction. Classes meet at my carving studio in Long Island City, near P.S.1 and the Court Square stops of the E, M, 7, and G subway lines. Click here for directions. ​Please indicate whether you want the afternoon or the evening class when signing up! I'll get back to you with the registration form and instructions. FEE: $630 for 5 session classes includes wood blanks, and access to carving and design tools. CLASS TIME: Five sessions (@ 2.5 hours each). PAYMENT: Payments must be received before the first day of class, by check or via Paypal (a 3% surcharge will apply when using Paypal). CANCELLATIONS & REFUNDS: If a given class doesn't reach my enrollment goal, I may cancel the class before it is scheduled to begin. If I cancel a class, I will issue full refunds of prepaid fees. No refunds are granted after the first session. LIABILITY WAIVER: Before the start of the first session, each student must sign a standard liability waiver & release. Students must be eighteen or older.